* MXZ is constructed of heavy gauge steel and features a mechanism that adjusts both height and tilt. * The MXZ is Equipped with a rigid and durable steel foot plate. 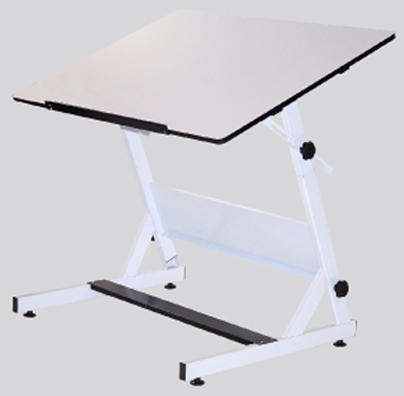 * Further, the MXZ features adjustable rubberized feet and a rear facing book or accessory shelf. * MXZ is finished with a premium baked enamel finish. * Available with white top (30"x42") and white base. 49" x 33" x 5"